Kavon McGraw (15) runs for one of his two scores against the Tigers defense. 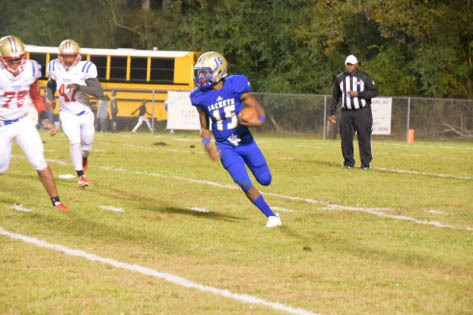 Aliceville wrapped up an 8-2 regular season Friday night with a 38-12 win over rival Greene County. The Yellow Jackets suffered a bad loss last week at Class 6A Selma, but was able to wash the taste out of their mouths before the playoffs with the win over the Tigers. Devontae Wright caught the opening kickoff at the 16-yard line and returned it 84 yards for a touchdown to give Aliceville a 6-0 lead before either team had run an offensive play. Zavien Wilkins then ran for a 38-yard touchdown to put the Yellow Jackets ahead 14-0 after one quarter. Quarterback Kavon McGraw found the end zone on a 16-yard run in the second quarter and then converted the two-point conversion for a 22-0 Aliceville lead. Greene County would get on the board before halftime when Devin Pearson ran for a 6-yard score to cut the Yellow Jacket lead to 22-6 before the half.